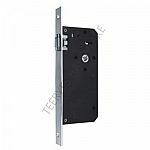 A mortise lock is a hardware device that fits into a pocket within a door. 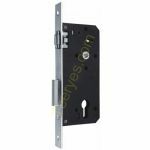 A mortise lock relies on a lever or sliding bolt lock mechanism. 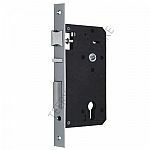 It is considered much more secure than cylindrical or tubular locks, and is the primary type of lock used in commercial applications. Mortise lock installation requires a pocket to be created in the door. 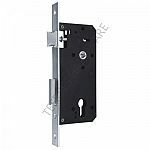 Mortise locks are composed of a number of different parts.